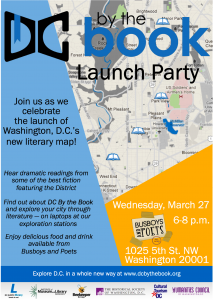 The DC Public Library is hosting an event to kickoff a new website — DC By the Book — Wednesday, March 27 at 6 PM at Busboys and Poets (5th & K Streets, NW). Special guest authors Thomas Mallon (Watergate), Ann McLaughlin (The House On Q Street), and editor Adam McKible (When Washington Was In Vogue) will be at the event with readings from their books. After the reading, a Q&A with the authors and crime novelist George Pelecanos (Right as Rain, Soul Circus, The Night Gardener, and many others) will follow to discuss why they chose Washington, DC neighborhoods as the setting for their stories. There will also be a dramatic reading by Chivonnie Gius from “Common Law,” featured in Edward P. Jones‘ short story collection All Aunt Hagar’s Children. Launch curator Kim Roberts, who’s created several walking tours of literary DC (and is editor of Beltway Online Poetry Quarterly), will read from The House On Q Street. The launch will be MC’d by former DC Citypaper Arts Editor Mark Athitakis who was the lead judge for Citypaper’s 2013 Fiction issue. Old school music from the 20s to the 70s will be mixed by DJ 2Tone Jones. …the stakes are higher for D.C. fiction, because unlike any other metropolis it battles the perception that those monuments are the city. DC By the Book is a website featuring a custom map that allows anyone to explore the landscape of DC through the eyes of local and nationally-known authors. 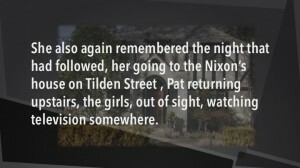 When a user clicks on a map icon, the popup box displays a passage from a work of fiction describing that location, as well as the book title (which links to the DC Public Library catalog record for the item), author, and other ancillary information about the work. Users will be able to browse the map or search using various filters, so that they could, for example, view only locations linked to a single author, or locations only described in crime fiction, or locations from a specific era. However, in order for the map to have any icons on it, passages from DC fiction will need to be entered. This is done via a simple form on the website that anyone can access as they’re reading a book set in Washington, DC. Several “mapathon” events will be held across the city in 2013 where anyone can drop by, read a book, and enter passages. 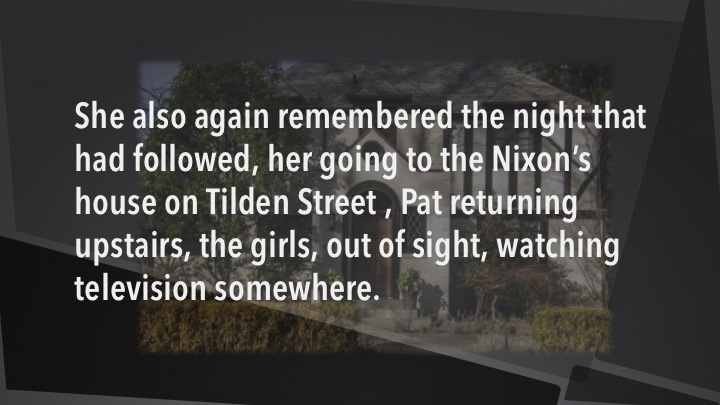 This excerpt from Mallon’s Watergate is included in the slide show (by Michon Boston) that will accompany the author’s reading at the March 27th kickoff. 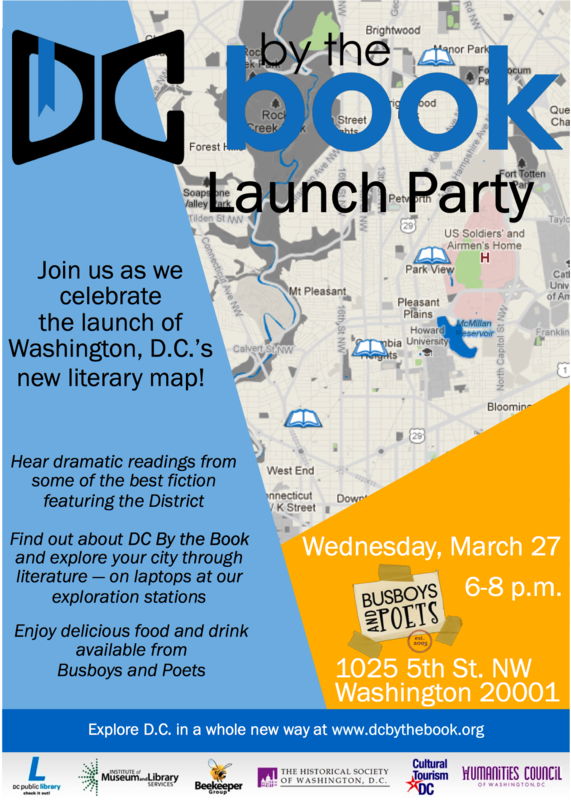 Bring your laptop to the kickoff or go to a station at Busboys and Poets (they have WiFi) to take the grand tour, and start reading and entering locations by authors ranging from Henry Adams, Stephen Collins, Ward Just, Susan Richards Shreve, George Pelecanos, Kia DuPree, and more. Visit DC By the Book at www.dcbythebook.org, and explore passages from great works of fiction about DC and upload content from your own reads. Contact info[at]dcbythebook[dot]org to learn more. Professor, George Mason University; co-chair, PEN/Faulkner Foundation Board of Directors; author.